Today, appropriately on a Sunday during the NFL season, I learned that a distant relative of mine played in the first game in NFL history. Not only did he play in the game, George "Hobby" Kinderdine kicked the first extra point in NFL history and his team, the Dayton Triangles, defeated the Columbus Panhandles 14-0. The date was Oct. 3, 1920. Kinderdine played center/guard in addition to kicker for 10 seasons for Dayton from 1920-1929. According to Dayton Area Sports History, he "earned a reputation of being the greatest center of that era" with "remarkable strength and athletic ability, supplemented with an uncanny instinct." 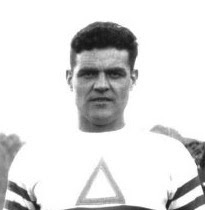 Kinderdine played with NFL Hall of Famers and All-Americans, and at times for Jim Thorpe's Canton Bulldogs when Dayton didn't have a game scheduled. Kinderdine passed on his love for football to his grandson Jack Kinderdine, who went on to play at Dartmouth, setting three Ivy League passing records his senior year and earning Associated Press All-American honors. My relationship to the Kinderdine clan comes through George's mother, Ida Grundish, born 1872 in Ohio. My maternal grandmother was Lois Grundtisch. The two trace their lineage back to twin brothers, Johann Nicolaus Grundtisch and Johann Adam Grundtisch, born June 26, 1736 in Pörrbach, Bavaria, Germany, sons of Swiss-born Adam Grundisch. I've posted charts for other prominent distant relatives of mine, including Johnny Depp and Nicholas Cage, here.